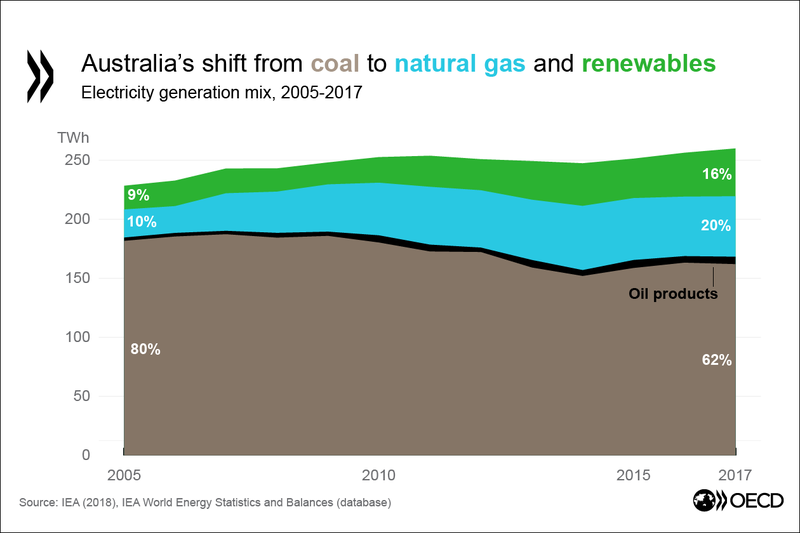 30/01/2019 - Australia has made some progress replacing coal with natural gas and renewables in electricity generation yet remains one of the most carbon-intensive OECD countries and one of the few where greenhouse gas emissions (excluding land use change and forestry) have risen in the past decade. The country will fall short of its 2030 emissions target without a major effort to move to a low-carbon model, according to a new OECD report. The OECD’s third Environmental Performance Review of Australia says Australia needs to develop a long-term strategy that integrates energy and climate policies to support progress towards its commitment to reduce greenhouse emissions (including land use change and forestry) to 26-28% below 2005 levels by 2030. Australia should consider pricing carbon emissions more effectively and doing more to integrate renewables into the electricity sector. With a fast-growing urban population along its coast and rapid infrastructure growth, Australia needs to address increasing pressures on its rich biodiversity. Australia has significantly expanded both terrestrial and marine protected areas, surpassing international targets for 2020. Its indigenous ranger programme is a highly effective model for nature conservation. More now needs to be done to monitor biodiversity and protect threatened species. Reliant on coal for two-thirds of its electricity, Australia has one of the highest levels of non-renewable energy use of advanced economies, with fossil fuel consumption still benefitting from government support. Coal, oil and gas make up 93% of the overall energy mix compared to an OECD average of 80%. The share of renewables in electricity generation has risen to 16% but remains below the OECD average of 25%. Australia’s power sector – the country’s top emitting sector – is not subject to emission reduction constraints. Australia has warmed by 0.9ºC over the past 60 years, with the warmest years occurring since 2005. Both rainfall and drought are likely to grow more extreme, and bushfire smoke and dust will increasingly affect air quality. The oceans around Australia are warming, rising, and are expected to become more acidic, exacerbating pressures on the Great Barrier Reef. Better water management is needed to respond to the changing climate and prevent further toxic algae blooms forming and killing fish in the drought-hit Darling River. Implement a national integrated energy and climate policy framework for 2030 based on a low-emission development strategy for 2050, in line with the Paris Agreement. Bring energy taxes in line with environmental impacts of fuel use. This implies taxing fuels that are currently exempt and increasing rates that are too low. Extend road use pricing through distance-based and congestion charges. Fill gaps in data on the status and trends of species and ecosystems, and establish national biodiversity indicators to measure progress and identify priorities for action. Increase investment in biodiversity conservation ecological restoration in line with the scale of the challenge. Improve monitoring of water resources, abstraction and quality across river basins. Do more to address water pollution from agriculture. Read more on OECD Environmental Performance Reviews. For further information, or to arrange an interview with the author, journalists should contact the OECD Media Office (+33 1 45 24 97 00).